Participate in Your Local Toys for Tots Drive! Toys for Tots began in 1947 and has the primary goal of helping bring the joy of Christmas and send a message of hope to America’s less fortunate children. The organization was created on behalf of the U.S Marine Corps and even gained support from Walt Disney himself, who created their logo. This year, Berkshire Hathaway HomeServices Montana Properties is partnering with ABC Fox Montana to be the statewide sponsor for the Marine Corps Toys for Tots! Each of our 15 offices will be a registered Toys for Tots drop off site and we will be taking toy donations for local children in our communities. These donations should be for newborns to kids fourteen years old; and, will be used to help families in need have a special holiday season. 93 percent of the donations remain in our local communities and any toys that don’t get distributed to families in need will be put towards the Salvation Army’s Angel Tree. 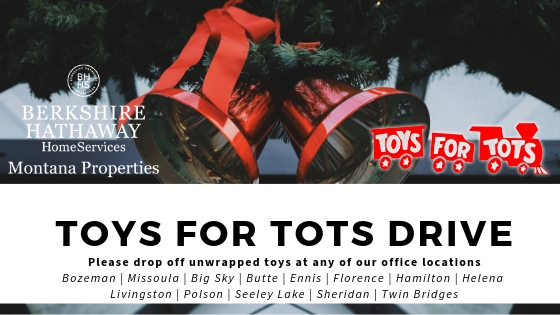 We are so happy to have all our offices and agents, involved in the Marine Corps Toys for Tots Drive in the state of Montana. Here’s to giving back and making our community’s children have a special holiday season!